Those of us who are still working may have painted a rosy picture of what retirement has in store. We imagine lounging in bed in the morning for as long as we choose, having a glass of wine with lunch, exotic foreign holidays and, perhaps, some light sailing, serious golf or a coast-to-coast road trip in a luxury RV. This is the stuff of TV commercials for retirement products. Those seniors, especially men, who can't afford to retire are finding it increasingly difficult to find employment. Those who stop working (whether as a result of downsizing, illness, termination, resigning or retiring) are 50 percent less likely to find a new job than younger workers in the same position. And, if they do get a post, they on average have to take a 20 percent cut in income. Sixty percent of those born between 1946 and 1964 (so-called "baby boomers") are still financially propping up their adult children, and many are doing so while also supporting elderly parents. The average retirement age has now jumped to 70 as seniors fight to keep their sinking finances afloat. Compared with 10 years ago, seniors now spend less on themselves in most categories of household expenditure. The biggest exceptions are health care, drugs and fuel. Incredibly, one in 20 of those over age 50 are still paying off their own student loans. Many are also guarantors of their kids' education debt. More than 63 percent of seniors had housing debt in 2007, up from 49 percent in 1989. As if all that weren't depressing enough, there's even more bad news. The amount seniors owe to their credit card companies is truly scary. In the decade ending in 2004, seniors' credit card debt increased 149 percent. And it's still going up. Forty-one percent of cardholders in this age group who are still working now owe more to credit card companies than they have in savings. Moreover, Andersen says that, at more that $35,000, the average credit card debt for those who are 60 years or older is far higher than for any other age group. The same figure for those in the next most indebted demographic (ages 50 to 54) is more than $11,000 lower. Small wonder many retirees have given up hope of paying down their cards before they die. When asked why they were filing for bankruptcy, fully two-thirds of those 65 and over cited credit cards as a cause. More specifically, they mentioned high credit card rates and fees. Surprisingly, that's a higher proportion than younger filers; only 53.3 percent of those mentioned cards as a cause. More predictably, "medical reasons" were cited by seniors as the second most frequent reason for their filing. Of course, seniors are often as capable of being irresponsible and frittering away money on frivolous purchases as younger people. However, last November, CESI Debt Solutions of Raleigh, N.C., published the results of a small nationwide survey it had commissioned. It found that when retirees were asked what they had bought when they went into debt, 75 percent of respondents said it was either medical or funeral expenses. Twenty-eight percent reported they had purchased food or groceries. Right now, we think we have high credit card rates. And we're right. The IndexCreditCards.com rates monitor says that the overall average for all cards is 16.43 percent. 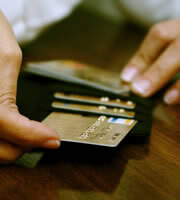 However, rates for credit cards are now usually variable, and are tied to Federal or other prime rates. So when sooner or later those begin to go up (and they're currently at historical lows so it's hard to believe that they won't), they'll drag credit card rates up with them. And then even more seniors are likely to see their dreams of a rosy retirement turn to dust. 0 Responses to "When golden years aren't so golden"